The Pension Hostel StayComfort am Kurfürstendamm is located in a classic-style building, this hostel in center of Berlin City in district of Schöneberg offers the comfortable stay for all kinds of guests. We do our best to make your stay comfortable and remarkable. A flat-screen TV with cable channels, fine wooden flooring and ceiling-high windows are all featured in each room at the Pension Hostel StayComfort am Kurfürstendamm. 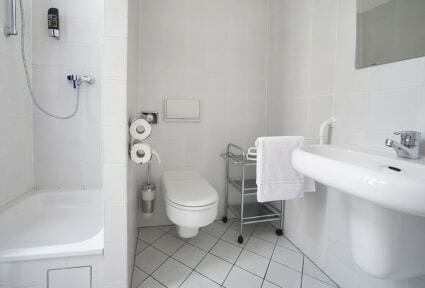 Rooms with shared bathrooms are available. We offer free Wi-Fi, common area and kitchen. It is situated just 300 meters from Nollendorf Underground Station and 500 meters from the famous shopping street Kurfürstendamm and KaDeWe trade center at Kleiststr. 35, 10787 Berlin. There are many cafés, bars and restaurants in the surrounding area. Berlin’s Zoologischer Garten is just 2 underground stops from the Hostel. Check in from 14:00 to 18:00. For late check ins (out of reception working hours) the guest has to inform us and get the instruction and key box code per Email and/or text message. Reception is from 8:00 till 18:00. Age restriction: in dorms 18 years or older. Bed linen – 2.00 EUR / person, no exceptions. Towel 1.00 EUR / Person. Laundry service 3.00 EUR/ one time usage. Wi-Fi in all areas of Hostel, Copy, Fax free of charge.